We are delighted that the Tech Data World App has been formally released to the Apple and Android stores. Head over to your store of choice and search for “Tech Data World”, you will see the TDW logo and hit that install button! The app was tested at this years TDW-Live#8 and the delegates loved it, interactive agenda, speaker profiles and sponsor details all made for the delegates engaging further with presentations and sponsors. What’s Inside and why you should install it! 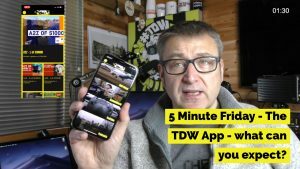 In this first release we have centralised all of our content, Podcast, Blogs, S1000DWorld as well as a QR scanner for those who read the TDW Magazine and want more content from TDW. Going forward we will be announcing member opportunities to our network via the App – so members are strongly advised to install to keep ahead of the game. What will be in the next release? We are working hard on the next release (planned for early 2019) – we are planning on releasing a new members directory, members announcements, job board and some nice nuggets that we hope will make the app your pocket friend from TDW. We will also be making all announcements for TDW-Live#9 through the app along with early sponsor and agenda information so you can keep up with what is happening for the 2019 event. What do you want in the app? This app is designed with our network in mind, so it is important you tell us what you want in the app – send in your feature requests and we will aim to make it happen in an upcoming release.